This page covers a few options for entertainment on the road. If you have some good ideas to add, please leave a comment at bottom of this page. We have latched onto having the Audible service read us books both while driving and in the evening at camp sites. This is a nice way to go in that it does not depend on having cell service or internet to work. You just download the book to your smart phone when you do have internet or cell service, and its then available anytime you want it. The service costs $15 a month, but that includes one book per month. You can try it for free. We have found the readers to be good. 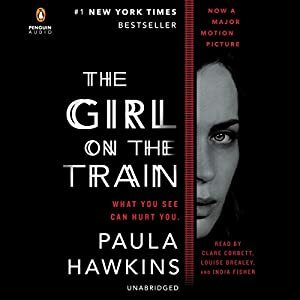 We listen to new books, but also to books that we read years ago and liked — nice to hear them again. 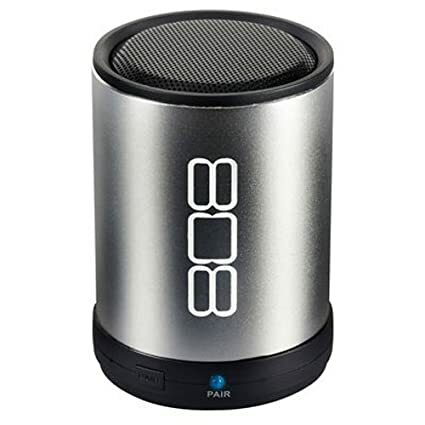 We use a small Bluetooth speaker for better audio than the phone provides. It is smaller than a coffee cup and can be moved around depending on where you are listening. Charging is via a USB cable and battery life on ours is about 6 hours. There are dozens and dozens of different sizes, shapes and prices — ours was only $15. We added a combination TV and DVD. This allows receiving over the air TV broadcasts with an antenna (if there are station in range), and allows watching movies, TV shows, etc. that you have on DVD. The one we have also has and SD card slot and a USB socket, so you can play things you have recorded on an SD card or USB thumb drive. 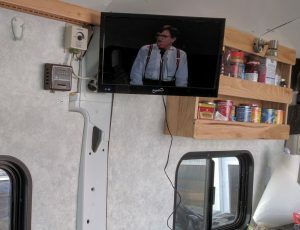 Ours is a 16 inch screen, which seems fine for the small space in the RV. 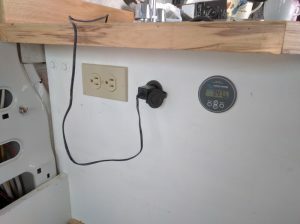 It is powered by either 12 volt or 120 VAC (via a wall wart), and only uses 0.45 amps while running, so, you can get a whole evening for 2 or 3 amp-hrs. The swing out mount works well in that it allows the TV to swing back up against the wall where it does not get in the way at all. The picture makes the TV appear small, but in reality it seems fine. It is mounted on a swing out mount on the wall just above the foot of the driver side bed — so, you can lay back in bed and watch. The mount is nicely made, and holds the lightweight TV quite securely. I attached the swing out arm to the vertical metal pillar near the foot of the drivers side bed. 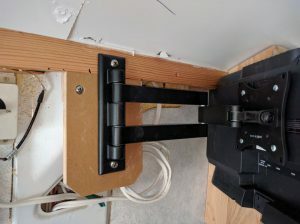 I used a scrap of MDO plywood to provide a flat surface to mount the swing arm to — it seems quite secure, and the arm does a good job of keeping the TV stowed against the wall when swung in. I added a 12 volt outlet on the bed end of the galley to plug it into. DirecTV (and I think DISH) offer an app that allows you to copy TV shows and movies from your DVR to your tablet for viewing offline. This would allow you to move a few shows to your tablet before you go on the road, and watch them at anytime. I’ve had mixed results with this. On our DirecTV setup, it takes a very long time to move a show to our Android tablet. There is first a preparation phase, which takes a long time, followed by a copy phase that also takes a long time. I’d be interested in hearing from anyone who has had better luck with this. 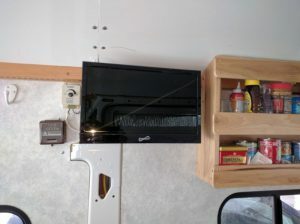 If you have a good internet connection, you can, of course, stream content from the internet to a tablet on your RV. But, in our experience, internet connections on the road have been non-existent to poor, and would not support streaming. If you have a large data plan on your phone, you could use the phone (at least most of them) as an internet hot spot, and use your cell phone connection to stream. This supposes you have a good cell phone signal and a good data plan. The satellite TV suppliers offer dish antennas that you can take on the road with you. They are pricey, take up roof space, and seem like overkill to us for a small RV.